Rare UNICORN white on black LOW MILEAGE Audi Q7! AWD Quattro, clean Carfax, west coast owned and dont forget about those miles! This car still drives like its new! The inside and outside are also in exceptional condition and it makes sense with such low miles for the year. 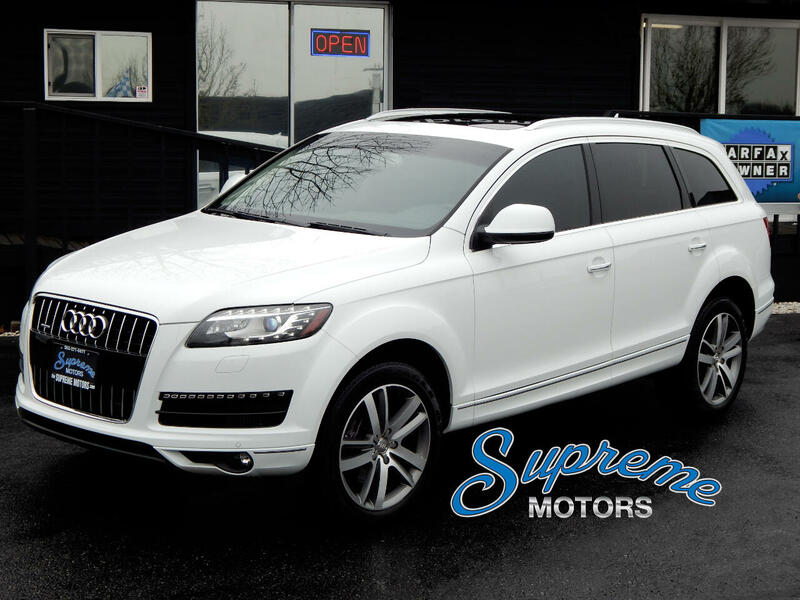 This Q7 has ALL the high dollar option's including Bose Premium Stereo Pkg, Heated Steering Wheel, 20" Sport Package Audi Wheels, Backup Camera w/3D front/rear Sonar, Heated Front/Rear Seats and so much more! This Q7 is also equipped with the Dual Panoramic sliding sunroof's, Bluetooth, Voice Commands and power everything! There is something about a white on black Audi.. Its the color combo everyone wants! If you dont value white, dont but THIS Q7, even dealers pay way more for white. Factory white paint on pretty much all the luxury brand cars sell for way more because thats what most people want. White shows of the body lines and is extremely easy to maintain. Its crisp, clean, and also way easier for other drivers to see on Washington's sometimes gloomy roads! Plus this one has the 20" Sport wheels with new tires! The LED headlights and turn signals really set off the whole look of the outside especially with the nicer 20:" Audi sport wheel package! Also, the BOSE stereo package is a must. If you haven't compared the base package to the BOSE package get prepared to be blown away! They are crisp and hit every note extremely crisp. Come on, its BOSE! Clean Carfax, west coast owned vehicle's hold their value so much better than cars with blemishes on their Carfax's. Buyers beware of dealers selling cars from the East Coast, Canada, and accidents/other damage on the Carfax's, you will take a huge hit when you try to sell or trade it in down the road. And not only is this Q7 a clean Carfax from the west coast it also has PERFECT service history all @ Audi. We pay more for the highest quality and best previous history on rare and hard to find cars because the ones that were taken care of extremely well are the ones everyone wants especially when you add in all the rare options and color combo to the equation. The TDI's have an extremely low cost of owner ship. For the last 7 years Audi has ranked in the top 10 for low cost of ownership and we have had almost no issues with them either! We absolutely love these 2013+ TDI's! The reliability mixed with such an amazing drive. You can tell why these Q7's where almost $80,000 out the door when new because they drive better than almost every other luxury SUV on the road AND have the low cost of ownership. Adding to the overall low cost of ownership on the TDI's is the exceptional fuel economy! At 28 MPG's on the highway and ALL the torque! This in the combo EVERYONE wants! Even compared to the gas models these are another level of amazing. The drive, the cost of ownership, and the look! These Q7's have it all, and one in white on black, with all the must have high dollar options AND stupid low miles! We are extremely impressed with this car! There is something about a white on black Audi.. Its the color combo everyone wants! Plus this one has the 20" Sport wheels with new tires! The LED headlights and turn signals really set off the whole look of the outside! The HID headlights and light bars in the rear lights give it the 2018 look! Clean Carfax, west coast owned vehicle's hold their value so much better than cars with blemishes on their Carfax's. Buyers beware of dealers selling cars from the East Coast, Canada, and accidents/other damage on the Carfax's, you will take a huge hit when you try to sell or trade it in down the road. And those Not only is this Q7 a clean Carfax from the west coast it also has PERFECT service history all @ Audi. We pay more for the highest quality and best previous history on rare and hard to find cars because the ones that were taken care of extremely well are the ones everyone wants. The TDI's get 28 MPG's on the highway and have all the torque compared to the gas models! Its amazing to drive and its nice having a little get up and go when your in your European luxury tank! The BOSE stereo package is a must. If you haven't compared the base package to the BOSE package get prepared to be blown away! They are crisp and hit every note extremely crisp. Come on, its BOSE!